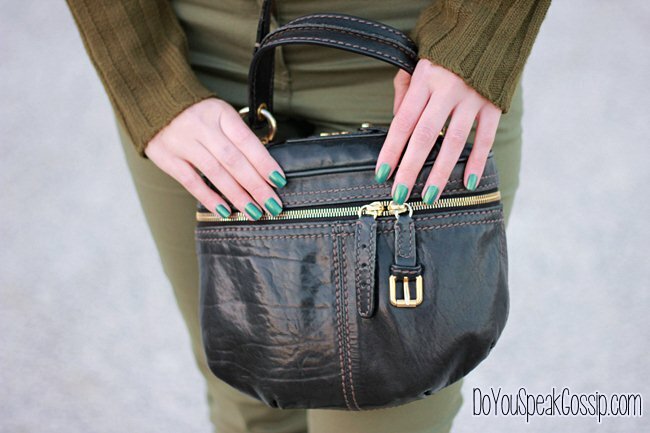 Monochromatic army green | Outfits - Do You Speak Gossip?Do You Speak Gossip? It’s been a while since I last wore a monochromatic outfit, so I really felt the urge to wear something like this for a casual afternoon, downtown. This time I paired it with black accessories, such as my Betty London booties that I’ve been wearing non-stop since I bought them. They replaced my biker boots for my casual outfits. Do you like the result? Δε μου λες, εσύ “κόλλησες” την Κλεονίκη ή εκείνη “κόλλησε” εσένα??? Χαμογελάστε, καλέ!!! Κούκλες είστε, ούτως ή άλλως!!! Το χαμόγελο απλά, κάνει τις φωτογραφίες να απογειώνονται!!! S’euxaristw para poli pantws gia ta kala sou logia! Na’sai kala! axaxa h kleoniki se kollhse chandleritida ? 😛 plaka kanw!! I think you look really beautiful wearing green, especially with the – again the same word, but it is honest – beautiful red hair! I liked the jeans ver much, the boots, the necklace! And you look so fit, this is like seeing a model! I am looking forward to more beautiful outfits, really love your pictures and style! Makia! Oh my god, take a look, I wrote maria instead of Makia! Sorry! I’m going to reply to your email tomorrow, because I wasn’t feeling very good today either. But for now only a small reply before I go to sleep! Good night! Filakia polla!!! oh this is one of my favourite colours, it looks great on you! Lady parisienne recently posted..A new year! Nikoline recently posted..Happy New Year! Ωωω τώρα τι να πω; Ειλικρινά κάθε φορά με σκλαβώνεις με τα καλά σου λόγια. Κάθε φορά που διαβάζω σχόλιο σου έχω ένα χαμόγελο μέχρι τα αυτιά. Σ’ευχαριστώ τόσο πολύ! Με κάνεις και κοκκινίζω! χιχι Ήθελα να βάλω ένα statement κολιέ για να σπάσει τη μονοχρωμία, και να ξεφύγει από το πολύ casual, κι αυτό ήταν το πρώτο που μου ήρθε στο μυαλό. Μ’αρέσουν οι minimal γραμμές του! Thank you very much Jamie-Lee! What a wonderful look. It so brings out your beautiful hairs. your booties are gorgeous and they’ll look fabulous with skirts and dresses as well. Thank you Ramona! I still haven’t tried them with skirts, and dresses, because I usually prefer more elegant shoes for those, but I’d love to try these as well. That’s a nice idea. παει πολύ με το χρώμα των μαλλιών σου!